Paulo the shepherd boy drives his family mad with his humming, so his grandfather gives him an old flute to distract him. But oh dear! His playing is really terrible and all his sheep run away. Luckily, Paulo is helped out by all the animals, birds and insects in the meadows he loves, and soon he is so confident that he challenges King Ocean himself to a contest. King Ocean is furious and summons Paulo down into his watery kingdom. If Paulo fails to play the king’s own flute, he will have to scrub the salt off the seabed for seven whole years. Can he do it, or will the mermaids have a new scale polisher? Wonderful, glowing pictures by Peter Malone make my words really come to life—and see if you can find the name board of the Titanic! A long time ago, I wrote a story called The Lady of Earth and the King of the Sea. It was really long, and I didn’t know what to do with it. Then my editor said that Peter needed a picture book. I looked in my ideas box, and saw that my old story was really a picture book text in hiding. I cut and rewrote and turned it all around, and ended up with King Ocean’s Flute. It goes to show that you should never throw idea stuff away—you just might find another use for it. It was a perfect story for Peter to illustrate, because his artwork is full of jewel-like colours, rather like the illuminated manuscripts of medieval times. I wanted the pictures to have a rather renaissance, Italian feel to them, and Peter has done a fantastic job of bringing what I had visualised to life. 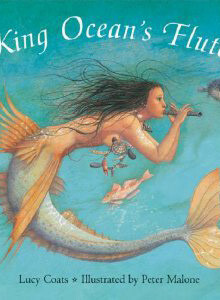 There’s so much to discover on each page, and I love all the witty little touches like the pot of Scaloglit for polishing the mermaids. “Lucy Coats spins a tale that feels like something handed down through generations of storytellers. In a noisy, post-industrial society, this story teaches readers to tune their ears to the quieter sounds of nature. This reader was reminded of a scene from the Italian film ‘Il Postino’, when the postman, a fisherman’s son, makes a cassette tape for his beloved poet, Pablo Naruda, with his collection of sounds from the island. Of all the books I’ve ever written, this is the one I most regret being out-of-print. It can still be found in secondhand bookstores and online at AbeBooks if you’d like to read a copy.